Recently I devoted a post to some of the great goalies of my youth from the 1960s and early ‘70s. One of those I mentioned was a true hockey pioneer, Jacques Plante. 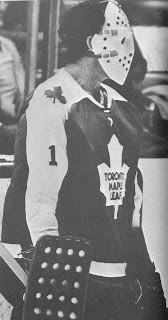 Young Leaf fans may only know the name or Plante as the guy who invented the goalie mask. Or they may think of Plante only as a member of the high-powered Montreal Canadiens, when they won 5 Cups in a row in the late 1950s. Plante was known to be a high-strung individual, but goalies have generally been thought of as a bit odd, so he fit the mold, in that sense. He was a huge part of helping Montreal win those 5 Cups in a row in the late ‘50s. It didn’t hurt that he played behind a defense that included some all-time greats like Butch Bouchard, Doug Harvey and Tom Johnson, and other stalwarts such as Bob Turner, Jean-Guy Talbot and others. He was indeed quirky, and hated, for example, playing in Toronto. Apparently his asthma acted up when he was in the city. In any event, one of the big hockey trades of my youth was the one that happened after the 1962-’63 season. The Habs were cleaning house after being beaten soundly by Toronto in five games in the semi-finals. Long-time winger Dickie Moore wasn't asked back after that season. Harvey had already been moved the season before. Now it was Plante’s turn to wear the scapegoat mantle. 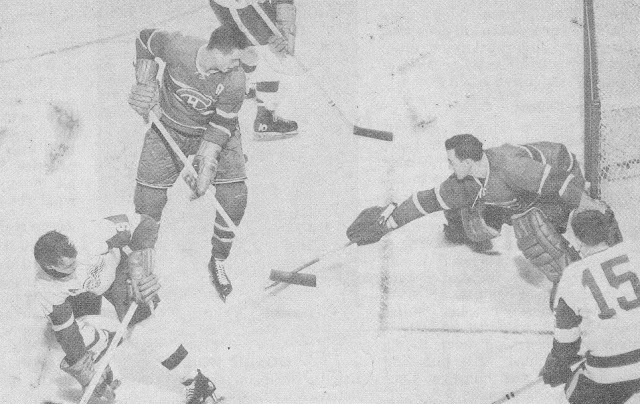 Off he went to the Rangers (we've also included a photo of Plante in action with the Rangers also against Howe and the Red Wings) along with Donnie Marshall and Phil Goyette, two very useful and talented young forwards who played roles in Montreal’s late ‘50s success. Goyette in particular wasn’t getting much playing time behind Beliveau, Henri Richard and Ralph Backstrom who were the top centers with the Habs. Rochefort and Balon were tougher, edgier players than Marshall and Goyette, who were smoother and more “finesse” players. For his part Plante really struggled with the Rangers. So much so, that by the following season he was primarily playing in the AHL with New York’s farm team in Baltimore. He retired at the end of the 1965 season, which at the time seemed a quick and sudden end to an elite career. 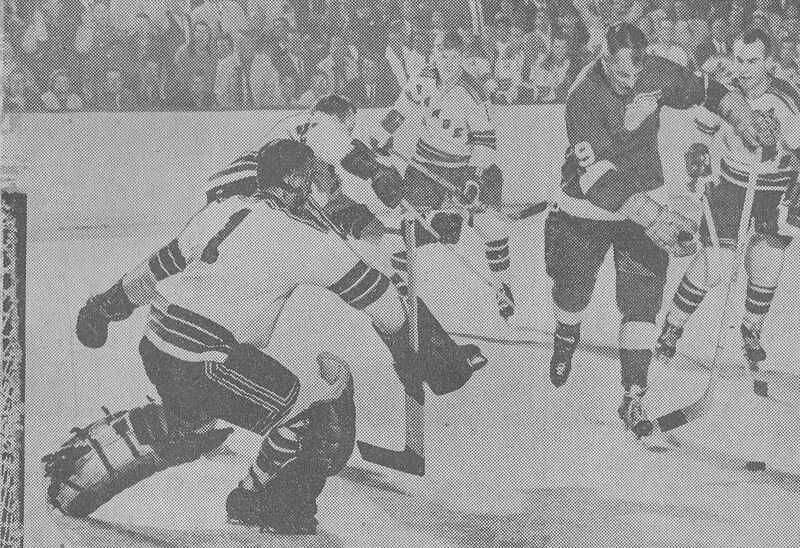 Yet after 3 seasons away from the NHL, Plante made a comeback and joined a very young Scotty Bowman and the St. Louis Blues for the 1968-’69 season. He was magnificent, and helped the Blues, along with fellow veteran goalie Glenn Hall, make the finals both years he was in St. Louis. He played there with some former Montreal teammates like Talbot and Ab McDonald. In particular I remember the night Plante (pictured at right with the Leafs) shut out the Canadiens 1-0 at the Gardens. He was simply outstanding in net. I remember a moment when he was roaming into the corner to retrieve a loose puck and got caught out of the net. 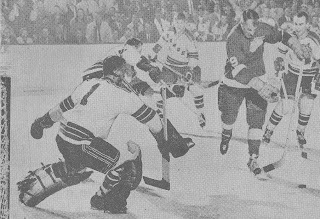 A Montreal winger, I don’t remember who, sent the puck out to Beliveau, who was sitting alone in the slot and quickly fired a wrist shot. It looked like a sure goal, but Plante came gliding majestically across the goal-crease just in time to block the shot. He went on to earn his shut out. That spring, he helped the Leafs make it to the playoffs, where they faced a rugged and emerging Rangers team. Plante was in goal for the first game of the series, and Toronto gave up a 4-2 lead. A flukey goal near the end of the second period spurred the Rangers, and they won 5-4. Toronto lost in six games, with Plante also in goal for the last game (Parent played the other playoff games), losing 2-1 in overtime. Plante played pretty well the next season, too, though not quite to the inspired level that he attained in his first year with the Leafs. They still made the playoffs, but lost to the Bruins and Bobby Orr in 5 games. Given Plante’s aforementioned public dislike of playing earlier in his career in Toronto, his performance was all the more surprising. Plante did one more important thing for the Leafs: he was traded by General Manager Jim Gregory late in the 1972-’73 season. The Leafs were going nowhere that year, as it was the season they lost so many guys to the WHA, including Parent. So Gregory wisely grabbed a first-round choice from the Bruins for Plante. Toronto used their own selection to grab Lanny McDonald that summer, then took either Bob Neely or Ian Turnbull (I think it was Turnbull) with the selection they got from Boston. In any event, that turned out well for the Leafs all the way around. Plante played out the season with the Bruins, then retired again, only to come back one more time to play with the Edmonton franchise in the WHA. He was a marvelous competitor, and I’ll always remember that he gave the young Leaf defense (Ley, Selwood, Glennie, McKenny, Dorey, Pelyk) a ton of confidence in that 1970-’71 season-long after he had any business playing—and playing quite brilliantly. We’ll see if the Leafs this season, behind Giguerre and a promising youngster, can replicate what Plante helped Parent and the Leafs achieve forty years ago, also after a number of losing seasons.